Kate Gundlach is an assistant engineer for IndyCar driver Charlie Kimball and aspires to be a lead engineer. They'll probably never drive into a corner at 200 mph, appear in a Super Bowl commercial or make a music video with Jay Z. That's OK with Kate Gundlach and Andrea Mueller. While they won't ever have Danica Patrick's celebrity status or even the name recognition of, say, Katherine Legge, the two behind-the-scenes racing stalwarts know they're doing something historic and cool in motorsports. Gundlach, 31, is the only female engineer in the IndyCar series who's on the timing stand and in contact with the driver throughout a race. Mueller, 35, is the lead race engineer for Penske Racing's No. 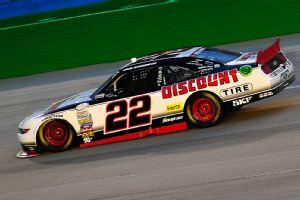 22 car in the NASCAR Xfinity series, and it's no accident that the car has won the last two team owners championships and leads the points this year. Andrea Mueller is compiling the résumé of a future NASCAR crew chief but so far hasn't expressed interest in that job. If you think it's no big deal in either case, watch an IndyCar or NASCAR telecast on any weekend and see how many women you can spot on pit road -- in any role, let alone leadership positions. Gundlach and Mueller have key jobs, and they're easy to point to as women who could one day lead an IndyCar or NASCAR team, even if only Gundlach aspires to that role. The historical significance "never really occurred to me before, but now that I'm stepping up to that platform, I can see the significance," said Gundlach, who grew up in Pennsylvania around her father Tim Gundlach's vintage motorcycle racing and earned a mechanical engineering degree from the University of Pittsburgh. "Up until now, the guys have treated me like a family member, so I've never felt singled out. But then you look around and say, 'Hey, there aren't that many of us out here. OK, this could be really something.' "
Gundlach seems to have the tough outer shell needed to get there. 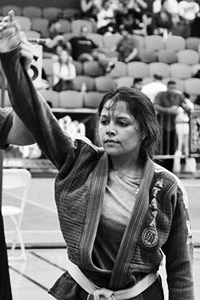 A blue belt in Brazilian jiu-jitsu who fends off the invariable sexism that comes in a male-dominated sport by giving it back ("That's probably not the HR way of handling it," she admits), Gundlach blends in and has won a host of admirers. She admits she has to take a different approach with what she sees or hears once in a while from the fans. "You get things like, 'Don't you have a guy who should be helping you do this?' " she said. "Or, 'I can't believe these guys are standing here letting you do this on your own' -- that kind of thing. "I get a lot of looks and stares and questionable faces when I'm walking through a crowd. That can be distracting -- where people continuously watch you as you walk by. I'm like, 'Man, come on.' I try not to wear any tight clothing or anything revealing or anything that would attract attention to me in that way." Mueller also grew up around her dad's racing -- Steve Mueller was an engine tuner on Silver Crown and sprint cars -- but after earning a mechanical engineering degree from Cal Poly San Luis Obispo, she became, well, a rocket scientist. She did NASA-contracted work on the space shuttle, doing postflight inspections and preflight certifications. "The coolness factor of what we were doing was very high; it was just the day-to-day tasks that kind of wore me down on it," she said. Andrea Mueller is the lead engineer for Penske's No. 22 car in the Xfinity series. All the while Mueller kept her eye on racing, her first love. 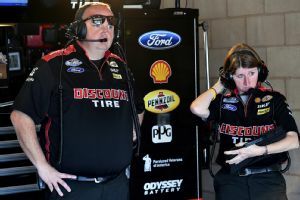 When her dad's connection to Sprint Cup driver Ryan Newman through the Silver Crown ranks helped her get an introduction to Penske Racing, she made the most of it. She landed with Penske in 2007, worked her way up to lead engineer on the No. 22 car and over the last three and a half years has helped that car win 20 races in NASCAR's No. 2 series with a rotation of drivers. "She has been amazing and a huge part of that team winning a couple of championships," said driver Ryan Blaney, who's sharing the car this year with former Sprint Cup champion Brad Keselowski and Daytona 500 winner Joey Logano. "She's always innovative, and that's something you have to have if you're going to be an engineer on a top team." Penske competition director Travis Geisler points to Mueller as being the constant on a team that has changed crew chiefs, car chiefs, mechanics and a host of other personnel over the past three years. "She has given us the continuity and kept the team on track, knowing its history and what we've done at different places," he said. Mueller is racking up the résumé of a future Sprint Cup crew chief -- no woman has ever held the role -- but to date, her response has been thanks but no thanks. Her sights are set on being a Sprint Cup race engineer, a role that would let her focus on technical and analytical duties while the crew chief calls race strategy. "Obviously, it wouldn't be me making the final decisions, but the crew chief and I are talking through every strategy as the race is going on," she explains. Geisler isn't convinced that Mueller won't someday change her mind, noting she "has the bandwidth, the work ethic, the mentality to achieve any level she aims for." He says, "I think she wants to stay focused on the highest level in that position before she looks at that possibility. Once she reaches that height, some of those thoughts may change a little." There aren't many women in the engineering ranks of big league racing, but some of those who have broken through have made an impact. Alba Colon is the Sprint Cup program manager for Chevrolet. Cara Adams is a senior project engineer for Firestone and helped design the tires used in this year's Indy 500. Leena Gade in 2011 became the first female race engineer to win the 24 Hours of Le Mans, and in 2012, she won the FIA World Endurance Championship's "Man of the Year" award. Former stock car driver Ashley Parlett, a hoot if ever there was one in racing, has been a car chief and suspension mechanic in the K&N Pro East and NASCAR trucks series for several years. Kate Gundlach practices jiu-jitsu to keep fit physically and emotionally. There's also Rossella Manfrinato, an Italian engineer now working for Ferrari who Gundlach says had a huge mentoring impact on her. And IndyCar mechanics Jessica Mace and Anna Chatten also have attracted attention for breaking through in their roles. Chatten, a longtime gearbox mechanic, was the first woman to go over the wall on pit stops in 2009, and Mace did that this year. "They're all really hard workers," Gundlach said. "Anna Chatten is phenomenal -- she's an absolute mental giant. Jessica Mace is a good buddy of mine. She has faced a lot more discrimination than I have. She has gone through a lot, so it's good to talk and have a network and push each other." Gundlach has had no trouble pushing herself as an assistant engineer for driver Charlie Kimball under lead engineer Brad Goldberg. She has worked feverishly toward her goal of becoming a lead engineer -- IndyCar teams are led by a race engineer and a race strategist rather than a crew chief -- and by all accounts, she is on pace to get there. "I'd love to be a lead engineer," she said." That's what I want to do. That's what I remind myself in the morning when it's the middle of [winter] and I'm like, 'Why am I doing this?' I'd like to make the decisions on the car." She is described as a blend of intellect, charisma and tenacity -- qualities Chip Ganassi Racing managing director Mike Hull says are needed in the "carnivorous" world of racing to achieve longevity and credibility. 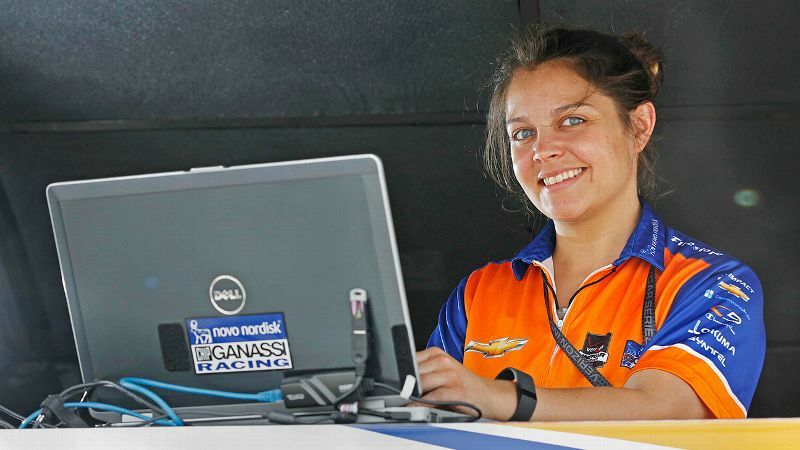 There's also her team-first approach: Her data analysis has not only Kimball but also the three other Ganassi drivers: veterans Scott Dixon and Tony Kannan and 20-year-old Sage Karem. "Kate is someone who is really positive, really driven, has a terrific skill set and a desire to not only participate but also learn from the mentoring group around her," Hull said. "That's what makes a successful person in racing, whether that person is male or female. We look at people who can do all those things inside a system and pull their weight." Kimball, who says he bonds with Gundlach because he too stands out, as the first IndyCar driver to compete with diabetes, agrees. "She definitely knows when to keep her head down, keep the nose to the grindstone, but at the same time, I really enjoy going out for a meal with her after the weekend or [also] with my engineer Brad, and we laugh and joke," he said. "There are a lot of different elements to her. She does that jiu-jitsu for fitness. Let me tell you: There are very few people I would want in my corner if there was a skirmish on pit lane, and she and Brad would be at the top of my list." Gundlach somehow manages to sound disarming when she talks about how the jiu-jitsu gym is "a good place to work out emotional problems instead of holding them in" and how "it feels good catching somebody into submission at the end of the day, it really does." "I'm always happy to tell Kate stories because I do think she's an extremely valuable member of the team," he said. "She is doing something really different, and frankly, I think it's really cool. I have a lot of respect for people who break boundaries, be it gender or anything else."